It will become mechanical work from waste heat of the water cycle by using ammonia to close the cycle of diethyl ether. - chart 3. 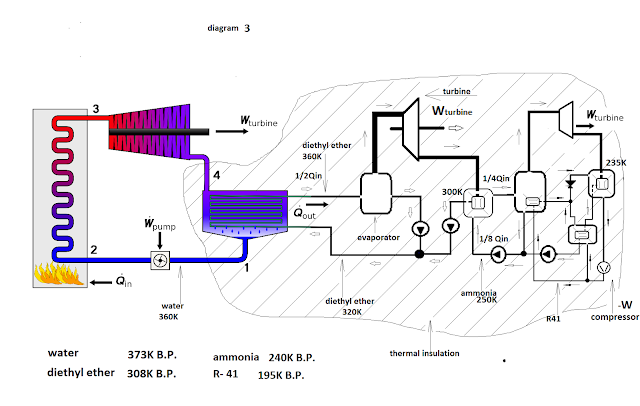 Because ammonia is liquid at temperatures lower than nature can offer us, I would have to close the cycle of ammonia as the cooling ammonia vapor to liquefaction.Compressor on cooler will take the useful power. As mechanical energy producing cycles of ammonia, so will spending to close its cycle. The unit of this figure and unit of the chart 2 will be equally useful. It is worth recalling that the low temperatures of the working substances must be preset before launching the operation of the unit. But the topic to the burning of hydrocarbons did not think to end up here. Публикувано от Svetozar the Cold в 3:08 ч.